There was huge excitement as these two teams came off the back of 3-3 draws in midweek to play the biggest derby fixture in the Best League In The World™. Unfortunately it wasn’t the most entertaining of derbies, with both teams recording an xG (expected goals) of under 1 (0.8 and 0.7 respectively). This piece will focus on two of the main issues that have been on the minds of all Premier League fans this season: why are United so rubbish in attack? and why do they concede so few chances. I’ll also have a look at Liverpool’s attacking strategy. 4-3-2-1 for Liverpool with Firmino as a false 9 and Lallana and Milner operating across the width of the pitch behind him. United set up in a 4-2-3-1 with a rotating three in midfield. Manchester United’s flat build-up shape. As they always under Van Gaal, United aim to progress up the wings in build up play. They attempt to do this by passing from side to side until they find space to progress up the pitch. The problem with the above shape is by the time that they’ve passed it all the way through from Blind to Smalling, Liverpool’s defence has shuffled and United cannot play it up the field. 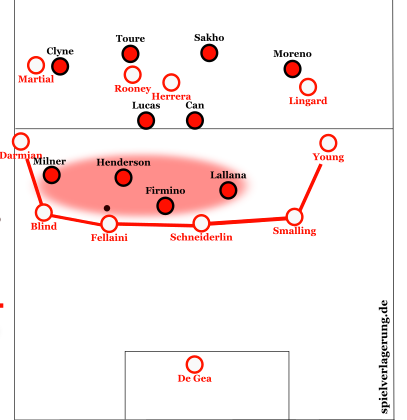 United’s lack of staggering (the placement of players on different horizontal and vertical axes, thus creating triangles and rhombuses that make for a competent structure for possession football) means that they can be pressed by a flat line of Liverpool players, with there being no chance to beat this line of pressure with one vertical pass between two of the pressing players. Here, Van Gaal’s side have managed to find some space wide and progressed with the ball over the halfway line. United are too wide orientated however and Liverpool have simply gone man-to-man on the flank, with Moreno tight to Lingard and Can tight to Herrera. Young has no inside option with Herrera hugging the touchline for some reason, and Schneiderlin, who should be acting as a pivot, occupying Sakho. Young is forced to play a speculative long ball forward which reaches no-one. This is typical of United’s strange possessional structure. This one doesn’t need much explaining. Anyone can see that Herrera has nowhere to go. United have a straight line up the flank from Darmian to Martial. They have made about ten passes in the build-up to this moment. Again, Herrera is on the touchline for some reason, meaning United have only one player in the opposition half that is in the left halfspace or centre. There is no way United can penetrate Liverpool’s back four, never mind doing so centrally, with this sort of structure. United are also far too static when they have possession, with no players looking to make runs into space or behind the Liverpool defence. Wayne Rooney’s recent spark of form was nowhere to be seen (until he finished well to score the winner late on) and he was regularly outpaced by Kolo Toure. A desperate state of affairs. 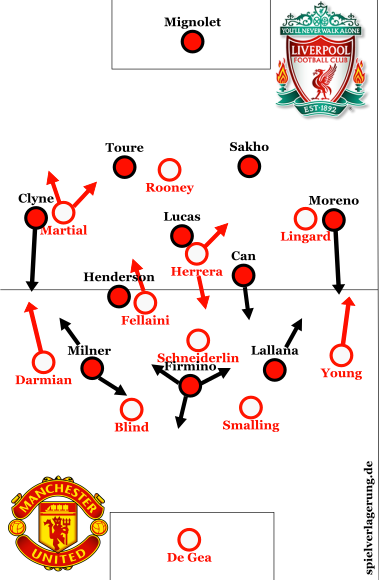 United’s poor structure, especially when building up in their own half, made them very easy for Liverpool to press. Fellaini was often used as United’s outlet when forced back to De Gea while under pressure. 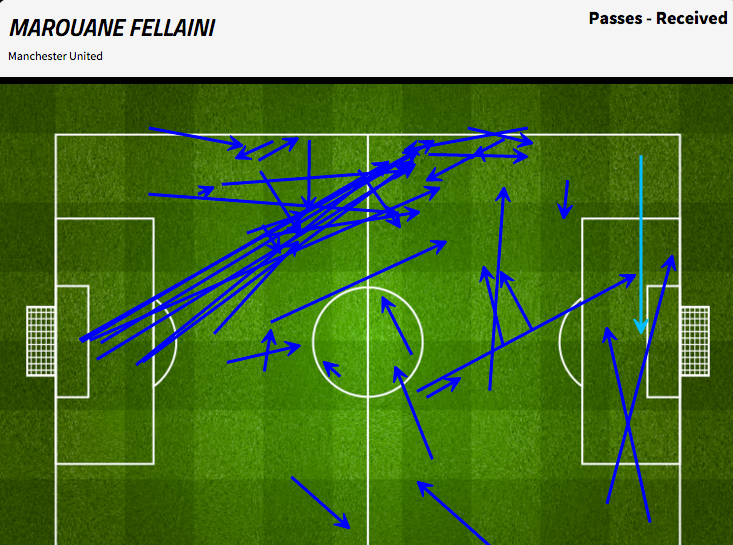 The below map shows how often a long, high pass was played to Fellaini. If in doubt, hit the big Belgian. Manchester United don’t concede many chances. A lot of this is to do with the pure numbers that they get behind the ball, and the depth at which they defend at times, which hampers their threat during attacking transition. However, United do have a solid and effective defensive structure. United’s middle third defensive organisation. United don’t press the ball when it’s at the feet of the opposition centre-backs, they hold their midfield line at around the halfway line. They are very man-orientated however, moving around with their men, even if it moves them out of the zone they should be occupying. Young has pushed up and is marking Moreno while Martial has dropped back to left-back to create a back four. Martial often takes up this left-back position with his role in the match being similar to that of a left-wing back. This meant he often couldn’t receive the ball high up the field in space during a counter attack as his starting position was too deep due to these defensive duties. Man United’s tight marking of Sakho’s immediate options mean that when they receive the ball, they will not be able to turn. However, giving Sakho so much time on the ball does give him lots of time to assess his options and it gives Liverpool a chance to create a space in United’s defensive line. Man United’s players will stay tight to any players who could directly receive the ball. Above, Blind has moved out of his line to stay tight to Firmino. Martial moves back towards his left-back area which allows Darmian and Smalling to move together to close the gap that Blind has left. Due to Blind’s tight marking of Firmino, when he receives the ball he can only play it back to Sakho. United regularly limited Liverpool’s build-up play to Liverpool’s own half. Manchester United committed many bodies back to defending throughout the whole match. They players with great horizontal compactness and had minimal spaces between players. The above situation shows how they have a 9v6 situation in their favour around the ball. 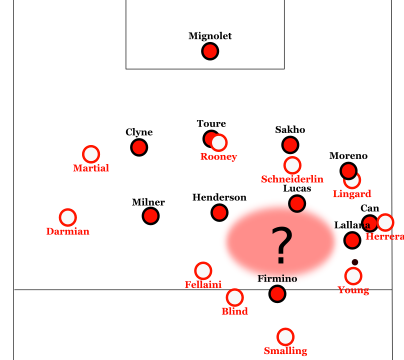 Although this increases their chance of shutting Liverpool out, a 3:2 ratio is somewhat unnecessary and makes them less of a threat on the counter attack, especially with main threats Martial and Lingard within 25 yards of their own goal. 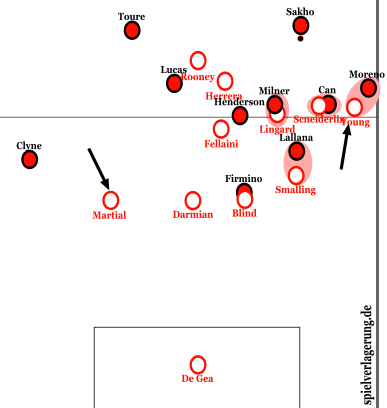 United were arguably too deep at times, allowing Liverpool 12 shots from outside the penalty area. These shots have a lower xG of course, but they still do hold some danger, especially having seen Roberto Firmino’s goal against Arsenal last Wednesday. 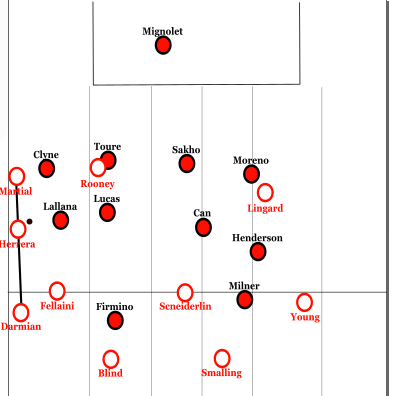 Liverpool were more centrally orientated in attack than they have been and it didn’t work too well considering how United were content to hold a horizontally compact central shape. Firmino, playing as a false 9 would drop deep to receive the ball however he was flanked by Lallana and Milner. Neither of these players are wingers or have lightening pace so playing Firmino as a false 9 meant Liverpool had three players that weren’t keen to make penetrating runs behind United’s defence. Milner would move to either side of the field to link up play behind Firmino, decreasing Liverpool’s presence on United’s last line of defence. Liverpool will be disappointed with this home defeat as they didn’t deserve to lose. On the other hand, they didn’t really deserve to win either as they didn’t create many dangerous chances and failed to penetrate United’s organised defence. Manchester United somehow get away with a win but LVG’s worries about their attacking play continue. He needs to either make a big change to his attacking approach or leave the club, as their current style is too predictable and ineffective.